I love household items as gifts, especially useful ones, like the Kitchenaid mixer and Pyrex bowls I got last year, although I know not everybody feels the same way. 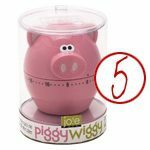 But if you’re looking for a special gift for someone who appreciates those types of items, here are my top picks! 1. 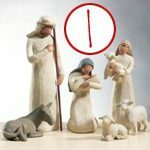 My Willow Tree Nativity is one of my absolute favorite Christmas decorations, and I received different pieces, including the creche and wisemen, over several Christmases. It’s a beautiful, quality set to compliment any decor! 2. 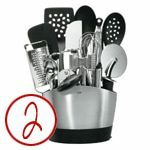 This would be perfect for a newlywed couple or someone who’s moved out on their own for the first time, but even someone who already has a functioning kitchen can appreciate a set of quality tools! 3. 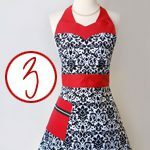 I have a few aprons — including a black and white damask one similar to this one — and even though I’m not a great cook, I love to put on my apron when I’m cooking or baking! 4. My husband took one look at the price of this knife set and said, “You are not a chef. 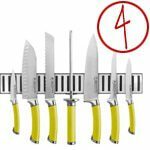 You do not need those.” He’s probably right, but if you do cook regularly, having a quality knife set is a must. And having one that’s kind of funky is even better! 5. How cute is this timer? I’ve mentioned that I love gift baskets, and I think you could add this to a gift basket with a couple gifts in a jar — like soup, cookies and maybe a spiced cider mix — for a fun kitchen-themed gift! 6. 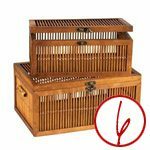 These bamboo storage chests are eco-friendly, functional and pretty — the trifecta for household goods! 7. I received a KitchenAid mixer last Christmas, and it is by far one of my favorite kitchen appliances. 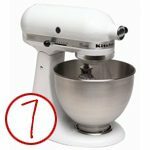 It makes baking a breeze, and I’m looking forward to getting a couple of attachments this year so I can do even more. 8. 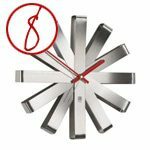 I love Umbra’s modern decor — from picture frames to wall hangings to clocks, and this clock would make a great addition to any modern home! 9. How cute is this? 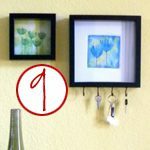 A custom watercolor print paired with built-in hooks to help you organize necklaces, keys or whatever you need to hang up.